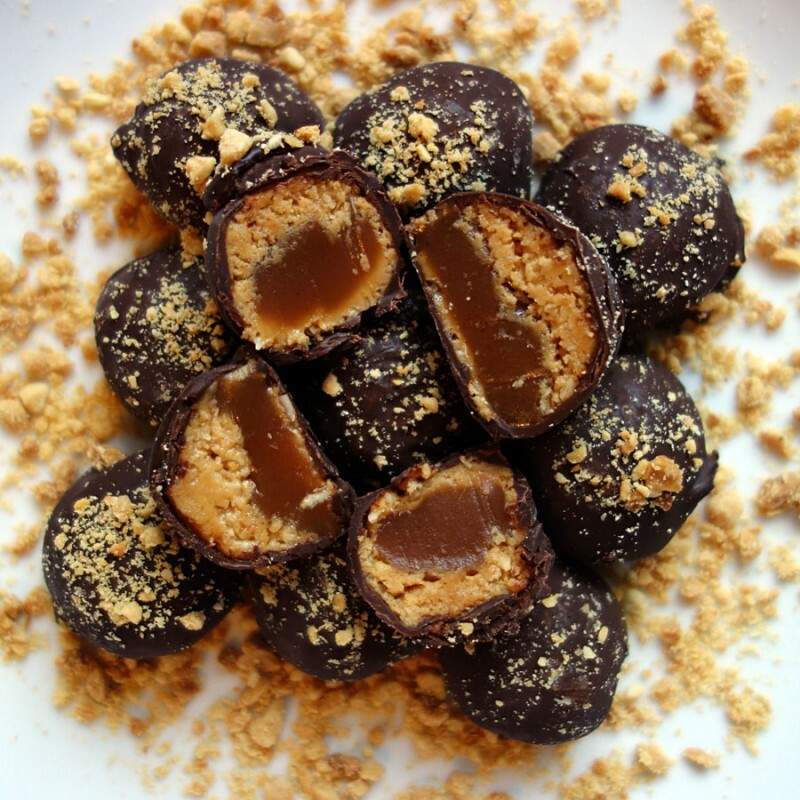 When Jay, the Verizon tech (and ex-chef), was fixing my internet, he described these Chocolate Covered Peanut Butter-Coconut-Honey-Caramel Balls as part of his Thanksgiving menu. I thought, “I’m totally stealing that idea.” They will forever be known as Jay’s Sweets. In a medium bowl, mix the peanut butter, honey, and coconut. Cut the caramels into 1/2” squares and keep them in the refrigerator until you’re ready. Have ready two sheet pans lined with plastic wrap or waxed paper. Scoop a teaspoon of the peanut butter mixture and roll it around the caramel so it makes a ball. Set the balls on one of the sheet pans. Chill in refrigerator. Have ready the tempered chocolate. Using a dipping fork or a regular fork, dip the balls in tempered chocolate. Tap to remove excess chocolate from the chocolate ball and place them on the second sheet pan. Sprinkle with peanuts. For this recipe, I made the caramels myself and used half of the recipe below, but took the caramels only to 245 F° when I made them because I wanted them to be soft. I froze the rest. When I had my chocolate store I used Peter’s Caramel Loaf which you can buy online. You can try using Kraft caramels as well, but they’re not as soft as homemade. *SHORTCUT: If you don’t want to temper the chocolate, you can just melt 1 pound of chocolate with 1 tablespoon of vegetable shortening in a double boiler over just simmering water. Have ready a bowl of crushed peanuts. Dip the peanut butter balls in the chocolate or roll them in the chocolate with gloved hands and them toss them in the peanuts until they are completely coated. Chill in the refrigerator until they are hard.